Experience, Passion, & Service You Can Trust! "Giving our customers the very BEST products at the MOST reasonable prices possible." v WHO: White Pigeon Sales (A sister company of United Doves L.L.C.) provides their existing and new customers all the necessary equipment, supplies, birds, literature, and expertise necessary to get YOU started in The White Dove Release Industry. We have been in this business since 1989, and are the largest and Oldest Successful White Dove Release Supply Company on the entire Internet!! A private firm backed by knowledgeable Staff with years of first hand direct “specialized” experience and expertise in this industry that you won’t find anywhere else, except right here on our website. We are ready to serve you as soon as you are ready to get started in the business. v WHAT: We have a combined experience of over 100 years with assisting our customers and clients in building their very own White Dove Release Businesses which they operate solely under their legal business entity name in their prospective area. IF YOUR DREAM IS OUT THERE TO OWN A BUSINESS AND YOU ENJOY WORKING WITH BIRDS AND ANIMALS, THEN BRING YOUR BUSINESS TO US AND WE WILL SHOW YOU HOW TO EXACTLY ACHIEVE IT IN THIS INDUSTRY!! v WHEN: In 1989, Daniel Hash (Founder) began releasing his “RARE” (50) White Homing Pigeons flock on a regular basis in Utah for special events as requested. As business grew solely by word of mouth, he soon became the “Go to person” for others interested in getting started in this niche business for releasing White Doves at Weddings and Funerals and other special occasions. The idea was presented that he needed to take his “Specialized Experience” to a whole new level and serve a much larger customer base. While living in Little Rock, Arkansas in 2004 he did just that by systematically organizing the valuable information and launching the now world famous website found here at White Dove Sales. v WHERE: Headquartered now outside of Salt Lake City, Utah. We have continuously gained new customers worldwide on a weekly basis, but our primary focus is within the United States. We have a very large customer base which is spread throughout all the 50 States, in addition to a gradual growing customer base in Europe, Australia,and South Africa as well. v WHY: Our purpose is to educate and prepare customers with all the necessary supplies and equipment necessary to start their very own White Dove Release Business. We are indeed a results driven business designed to deliver the right messages, to the right people, at the right times, for the right purposes. We know that there are many misleading websites out there now that are doing the public a disservice by trying to copy, plagiarize, and duplicate our business models as well as website format. We hope to prevent people from becoming a victim of those sites. “GIVING OUR VALUED CUSTOMERS THE VERY BEST PRODUCTS AT THE MOST REASONABLE PRICES POSSIBLE”. Some things to consider prior to purchasing anything for your business..
We sell release doves specifically bred for the White Dove Release Industry! White doves are used for all special occasions to include funerals, weddings, grand openings, sporting events, Race for the Cure, Relay for Life, birthday parties, and more. When you bring your business to us, you can have the peace of mind knowing what we discovered many years ago: Building a successful business like ours has taken many years of dedication, experience, and commitment, as well as a proven track record of repeated sales with our customer base. We extend our appreciation to all of our loyal customers who have helped us become original world famous leaders in our industry. You may find cheaper birds elsewhere, but there's a very good chance you won't find better birds for the fair price we offer to get you started in this industry. We have been blessed to be able to share our birds with so many different families across the country over the years. We have a thorough understanding of what it will probably take to get your business started, and we are grateful for every new opportunity we are given which allows us to guide our valued customers in the right direction . Whether you are looking to start your own business, or need to find a company nearest you that performs dove releases, we have you covered. With more than 25 years of bird handling experience, we sell offspring from many of our White "Racing" Homing Pigeons. 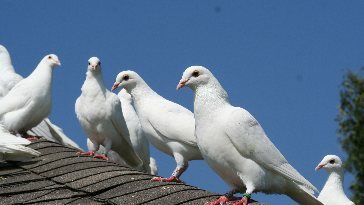 White Pigeon Sales offers true White Racing Homing Pigeons at an affordable price. We also offer more expensive direct imports from Belgium. Avoid the copycats out there that have tried to follow our business models by starting other types of supply companies. They may always try to imitate, but they will never be able to duplicate. White Pigeon Sales is a company with great experience, great passion, and great purpose behind what we do. Ours has been a trusted website and a company that has operated successfully for many years. For All Your White Dove Release Needs! Exceptional service to all those who do business with us. Prompt answers to your questions about the White Dove Release Business. Advice about the pros and cons of this niche industry. Information about what does and does not work when it comes to creating value and meaning to your customers. Insights into the trends of the White Dove Release Business and its untapped opportunities. Real answers from real people who want to help you get started in the White Dove Release Business. Products that are internationally patented and protected with years of research, development, and funding. Our products and services really work! For more information about us, please visit our About Dan Hash, Frequently Asked Questions (FAQs), and About Our Birds pages. View our birds and other products for your White Dove Release Business!